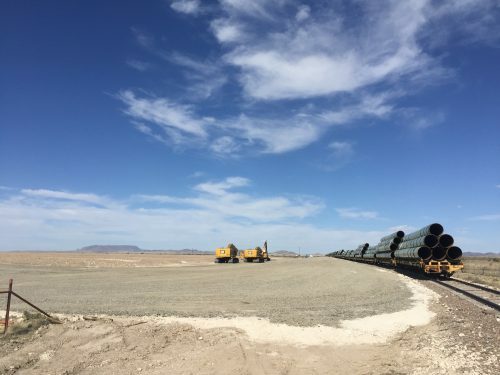 A special commission appointed by District Judge Roy Ferguson to settle compensation claims in eminent domain lawsuits tied to the Trans-Pecos Pipeline has sided with landowners and against the pipeline company – Energy Transfer – in six of seven cases. The Dallas-based company has invoked its legal power to condemn land through eminent domain against multiple landowners in the Big Bend region whose property the pipeline will run through. Now, the six landowners have won awards in the hundreds of thousands of dollars after receiving offers characterized as “low ball” from Energy Transfer. The pipeline will carry natural gas from the Permian Basin and underneath the Rio Grande to power Mexican electricity plants. Despite that, and the fact that a federal permit has been issued to bring that natural gas into Mexico, and the fact that Mexico is paying for the pipeline, Energy Transfer insists this project is for the benefit of Texas. Therefore, the company argues, it has the right to seize private land for the common good. But these six landowners have fought that idea and have won monetary judgements against the company. Bill Christian is an Austin attorney who won one of the few cases in Texas where a landowner prevailed over a pipeline company. That case is under appeal and will be heard this fall for a second time before the Texas Supreme Court. Christian put the judgements against Energy Transfer into perspective. “Even though it is significant money for the landowner, in the grand scheme of what this project’s going to cost, it’s still kind of a drop in the bucket,” he says. Landowners interviewed for this story said they are under no illusions. The company says construction will “ramp up” construction within weeks, but landowners also say they won’t roll over. Energy Transfer has promised to appeal at least one commission ruling in favor of a local landowner. “We are confident in the appraised land values we have established and will be appealing the recent ruling by the Presidio Commission to district court,” the company said in a statement. This entry was posted in KRTS News and tagged Courts, eminent domain, Energy, Energy Transfer, Environment, Law, Mexico City, Natural Gas, Oil and Gas, Ranching, Trans Pecos Pipeline. Bookmark the permalink.